ICYMI: Fiona isn’t doing so hot. Episode 10, entitled “LOS DIABLOS!”, picks up with Fiona in a frightening situation. She comes out of the back room of the diner, where she’s been nursing her vodka, to find three suspicious looking men have just entered. Though she tells them they can sit wherever they’d like, and that she’ll bring them menus, they seem to be more interested in her. Thankfully, an employee emerges from the kitchen just in time to scare the guys off, but Fiona is left understandably shaken up. The next morning, Fiona’s staff find her asleep in one of the booths. She explains that she was too afraid to walk home or take the L train the night before in case the men followed her, but it’s clear that everyone is beginning to get fed up with her being drunk on the job when she admits to leaving money on the counter when she wasn’t watching it. Fiona later finds out that they’ve ratted her out when she gets fired, despite her pleas and promises that she’ll do better. Unfortunately, this isn’t exactly a wake up call. Instead, the eldest Gallagher sibling celebrates the loss of her job by doing what she does best: drinking some more. Meanwhile, Frank has entered the Hobo Loco competition to become the face of a new alcohol brand. Though he’s found himself with stiff competition in another homeless man from Flint, Michigan, Frank keeps himself afloat during both of the first two challenges: building a shelter out of whatever he can find, and dumpster diving for dinner. His girlfriend Ingrid is essentially living in the Gallagher household now, and even working from her new home via over-the-phone therapy sessions. While Frank is away, Ingrid’s ex-husband arrives at the house with the doctor who inseminated Ingrid by his side, and though she is told she will likely die if she tries to carry her sextuplets to term, Ingrid refuses to abort any of the embryos and flees. Across town, Kev and V have agreed to foster Santiago’s sister Martina, despite the fact that Gemma and Amy don’t seem to like having a new sibling. When Martina arrives though, she announces that she and Santiago have decided to go back to Guatemala with their uncle, as their father has been deported and they want to be with him. Kev and V send off Santiago and his sister with heavy hearts. Perhaps the biggest plot twist of the season: Xan is back. 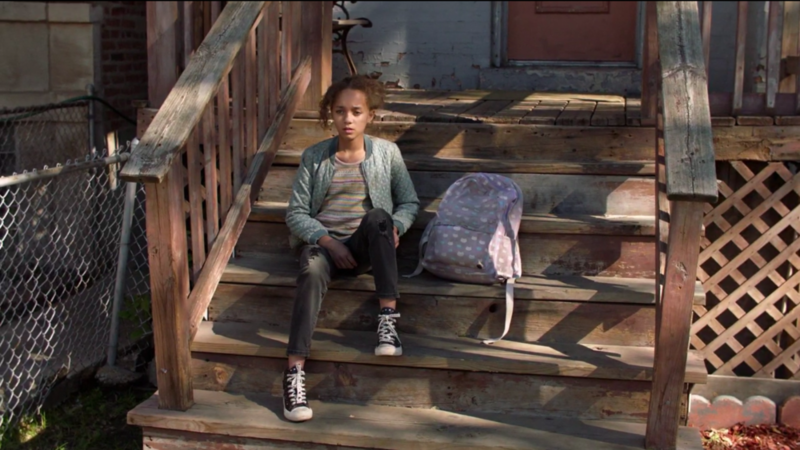 After Lip and Tammi spend the day running errands together, their first actual “date”, they find her sitting on the front steps of the Gallagher house. She reveals that her mom disappeared on her again, and she’s spent the last few days at a truck stop her mother used to frequent. Though furious, Lip has to put on a brave face for the child, and Tammi agrees to help out. If they weren’t already serious, they sure are now. Down the street, Liam is selling lemonade with a friend in order to help out with the bills. However, they set up shop on the sidewalk in front of a house, and the owner is not pleased with their business endeavor. She even calls the cops on the two boys. The black police officer who arrives seems to empathize with the them, and gives them a warning to get a permit and 20 bucks. 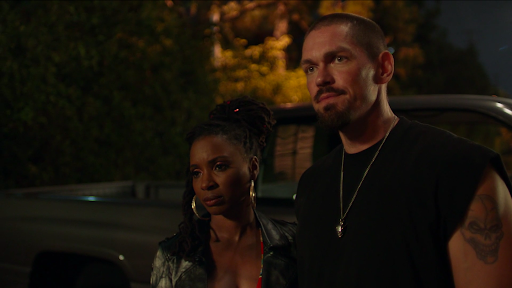 When Liam gets home and tells Fiona about the woman, she decides that Gallagher actions must be taken, and leads a crowd of people to the sidewalk in front of the house. In a heat of passion, Fiona jumps the fence and punches the woman in the face, only to be taken away in handcuffs by the cops. It seems as if every time Fiona thinks she’s hit rock bottom, she falls a little farther down. This episode felt like filler material for several characters, mostly Debbie and Carl who spent the duration working and making repairs to the house. Sans Carl getting beat up by drug dealers and Debbie temporarily getting stuck under the house, they didn’t provide much to move the plot along. Fiona getting fired is probably the most notable thing that’s happened to her since the second half of the season began. However, I’ve been waiting for it to happen, so it didn’t really shock as much as it could have if it were included a few episodes ago. Since Emmy Rossum is leaving the show, I expected a more creative and perhaps more eventful storyline for her leading up to her exit. I’m a bit disappointed that things are just starting to pick up now. I’m also conflicted about Fiona being given a very similar exit storyline to Ian’s. Though the next episode previews reveal that Fiona won’t stay in jail for long, her arrest seems repetitive from an entertainment perspective. We’ve seen this all before. After all, not only has Ian been arrested, but Fiona did time as well in Season 4. However, it is realistic that a Gallagher would go back to prison several times over, or that multiple of them would be incarcerated. Unfortunately, realism isn’t always the best method for keeping an audience. Surprisingly, I find myself most excited to see where Frank’s storyline goes. He has the potential to win a large sum of money and maybe even provide a better life for the six new unborn Gallaghers, if they end up making it out of Ingrid’s womb alive. My curiosity is fueled by his children’s doubts, and of course Ingrid’s insanity. I’m also intrigued to see whether or not Lip will become Xan’s legal guardian. He’s been on the straight and narrow so far this season, and I personally would love to see him become a dad. Though it seems like the road to fatherhood won’t be easy for him, so I’m excited to see how this process affects him going forward. Overall, this episode felt very up and down to me. Some plot points were very lackluster, such as Debbie and Carl’s stagnant and mostly uneventful days, but some felt like they had the potential to give us a couple more episodes of material worth watching. Frank, Lip and Fiona in particular had some great scenes in Episode 10 and seem to have the greatest setups for some growth as we finish off this season and move on to Season 10. Shameless airs Sundays on Showtime at 9/8c. Jessica Lyons is a Media Studies student, blogger, and TV-fanatic from Boston, Massachusetts. She’s a sucker for beautifully written and complicated character relationships and is especially passionate about shows with LGBTQ+ representation and strong, complex female characters. She also loves anything dystopian that can add to her dread for the future of human civilization.